It's time for the final two women to meet Nick's family, who I'm sure are so thrilled to go through all this crap again. But at least they get a free vacation! Raven is first up and she's met the Vialls before, so this is just a happy reunion especially with Bella who loves Raven and hopes her big bro picks her. Raven's maturity, sincerity, and love for Nick wins over the Viall family, so #TeamRaven (for now). Vanessa's family visit is... different. The vibe seems off and when Vanessa confesses that wants Nick, but unsure if she's ready to be engaged, it's definitely a red flag for a family that's seen their son's heart stomped on for TV purposes twice. Nick's dad understands his type but points out that hasn't worked out so well in the past, but a mutual cry sesh between dad and Vanessa makes him approve. Nick and his family have a recap on both women and foreshadowing the idea of Nick being alone at the end of this (which we all expect, let's be honest). For Nick and Vanessa's final date, they ride horses through the cold, wintery woods and it's breaktakingly beautiful, especially the camera angle of the jiggling GoPro strapped to the horse. Nick knocks on a random cabin door and it's Santa Claus. 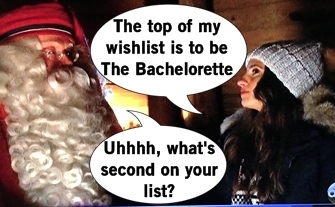 Nick says love tops his wish list, but I beg to differ when the Dancing with the Stars glitterball trophy is out there. Santa gives a gift to the happy couple: a wooden etched rendition of Nick and Vanessa which they place awfully close to a campfire. Nick and Vanessa talk about their relationship, which is another chance for Vanessa to remind us all that she only wants to be engaged once and takes it very seriously. Also that being slightly more loved than the loser isn't something she's into either. Vanessa's skepticism continues into the evening portion, tired of Nick's vague, runaround answers, and disliking the unknown. 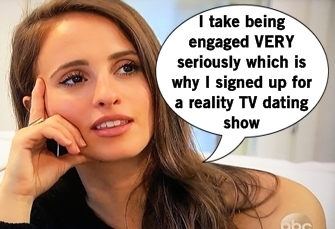 When asked if Nick is ready to propose, he dodges that question too with BS runaround and it's like... give me a break. But Nick goes onto a long diatribe that to be honest I tuned out of and Vanessa is sorta OK and still crying in fear. Great date!! Nick and Raven meet up for some ice skating at the ol' Lapland Safaris, the place where nearly every single date has taken place since arriving in Finland. Cue the reprise of Nick and Raven's song "Kiss Me" by Sixpence None the Richer, a song well over a decade old but I suppose timeless as the 90s teen rom-com it was featured in. They makeout laying down on the ice, which seems like a terribly cold decision, leading towards bundling up and sipping what I'll guess is spiked cocoa by the fire. Oh and petting husky puppies!!! The puppies are left behind and Nick meets up with Raven at her hotel for one last hoorah. Whereas Vanessa spent her night stressed, Raven is more relaxed and reassures Nick there's no hesitation and is ready. Nick says he always feels in the moment with Raven, lots of laughter, loyalty, and passion. Nick and Raven kiss goodbye and she drops one last "I love you" before they part. We're denied another craft project of love. Sigh. By a romantic campfire, Neil Lane and Nick pick out rings for the fourth time together. But choosing a ring and having to make eye contact with Neil Lane is only the second hardest thing Nick has to do. Yes it's time for the hard part: dumping one woman, a runner-up heartbreak Nick knows all too well. Raven and her shimmery silver dress, reminiscent of an ice queen, arrives for her proposal but we know that's not coming. Raven is giggly and nervous and gives her profession of love, but doesn't seem to read the look on Nick's face which is clearly, "I'm dumping you in three minutes." Nick tells Raven he's not sure he's in love with her and his heart is somewhere else. Raven takes it all with class and saves her tears for the car ride to the airport. Nick tell us he's been falling in love with Vanessa for a long time and no longer fighting it, hoping she'll accept his proposal. Vanessa arrives in a sparkling black gown and a big ol' fur, which Chris Harrison hangs up for her because his job is literally coat check at this point. Nick talks about how he began to fall for Vanessa at the second rose ceremony and he's in love with her, so much so that tears are streaming down his face. Vanessa talks about how she feared Nick would never notice her, but he notices everything about her. Nick gets down on one knee (AGAIN) and proposes to Vanessa, who in fact accepts despite all her past hesitance. Oh yay a happy ending for Nick! Onto After the Final Rose, which will allegedly have the most dramatic, historic event in history but I once watched a man dump his winner to pick the runner-up, so bring it. There's a quick Nick interview before bringing out Raven, who Nick hasn't seen since the Finland dumping. Nick's a pro at being dumped on reality TV and understood Raven's feelings, but she wishes him only the best. Since The Bachelorette is taken, we'll be seeing more of Raven on Bachelor in Paradise. Vanessa is brought out and explains how the relationship has been difficult so far, in particular differentiating Nick the person and Nick the Bachelor. Oh and because they're long distance in different countries and he's off chasing fame. Nick and Vanessa are reunited on stage and are very boring as they awkwardly "answer" questions and feign happiness. 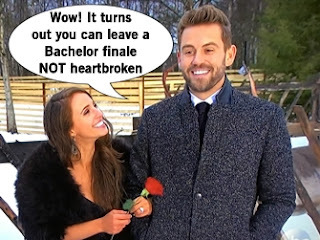 Thankfully, there's a reprieve in the form of new Bachelorette Rachel, who looks flawless. Chris asks lots of questions and she's most nervous this process won't work. Finally, the much hyped surprise is revealed: The Bachelorette is beginning immediately on After the Final Rose. They roll out a large format print of the mansion and bring out a few guys to meet Rachel, arriving in limos of course. DeMario has brought plane tickets (and a ring) to elope in Vegas, a guy named Blake with nothing interesting to say, a sweet guy from Baltimore with everything good to say, and a guy who says he's ready to go black and never go back. 2 out of 4 ain't bad.